With the Amazon Prime Day sales coming to an end at midnight tonight on the West Coast (3am Wednesday in the East), there are still a few hours left for you to take advantage of some awesome smartphone deals. For example, the unlocked LG V35 ThinQ can be yours for only $599.99. That is a $300 or 33% savings on the regular price of the phone at Amazon. This Prime Exclusive (in Aurora Black) will work with Verizon, AT&T and T-Mobile. The U.S. unlocked version of the Samsung Galaxy Note 8 in Orchid Gray is $300 off at $649.99. The phone is powered by the Snapdragon 835 Mobile Platform, works on all four major U.S. carriers, and features 6GB of RAM. At the sale price, you are taking advantage of a 32% cut off the handset's usual price on Amazon. If that is still a little too rich for your blood, you can take a look at the 64GB Moto G6. As noted, this is the 64GB model, not the version you'll find at Verizon. This unit sports 4GB of RAM, and will work on all four major stateside wireless operators. Lastly, the unlocked Huawei Mate 10 Pro is offered for $549.99. That is a 31% or $250 price cut from Amazon's regular price. Next month, this phone is scheduled to receive the GPU Turbo update, which increases the graphics capabilities of the phone while reducing power consumption. This model is a GSM device meaning that in the U.S., it is compatible with AT&T and T-Mobile. It features 6GB of RAM and 128GB of native storage. The clock is ticking. 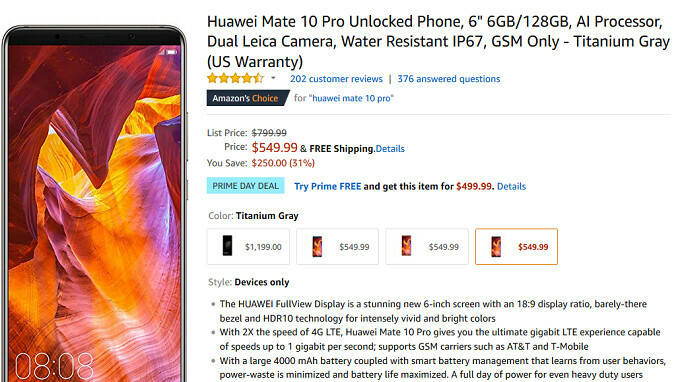 If you're serious about taking advantage of one of these deals, remember that you also have to be an Amazon Prime member (you can get a 30 day trial membership) to grab these handsets at the aforementioned prices. You sound like that's a bad thing. Better for consumers. I wish they would put the S9+ on sale for $300- $400 off with no trade in required. I'm not letting go of my V20 or Note8.